The first reaction of resolute mistress in fact burnt pots to throw out spoiled thing. The reaction of Thrifty Housewives – to take action quickly to rescue his beloved vessel. Really, why throw it away when it is still possible to improve, the more ways to clean burnt pans a lot. powder with fine abrasive particles. Rule number one: do not push the burnt pan into the far corner. It is advisable to proceed to its rescue in the same day. Then you can clear it without a trace. Otherwise, the place of burning-in will remain yellow spots. Rule number two: do not pour hot burnt enameled pot with cold water can crack and fly off the enamel. You have to give her time to cool down. Fill the place of burning-a large table salt and leave for 2-3 hours. Then rinse the pan with hot water. If the burnt remains, repeat the procedure. Make a strong salt solution (5-6 tbsp in 1 liter of water), pour into the pan and boil for 30-40 minutes. The penetration needs to go from the bottom and the sides of the pan. Take a few tablets of activated charcoal and crush them into powder. Pour on the burnt place and leave on for 15-20 minutes. Then pour cold water and leave for 20 minutes, then rinse the pot of any detergent for dishes. Activated charcoal helps in cases where the burnt milk. Make a strong soda solution (1 standard box of baking soda – 500 g 5-6 l of water) pour into a container, the size of more than burnt pan. Place the pot in a container and put on the stove. Bring to a boil and reduce heat. Simmer for an hour and a half. Turn off the heat and let the cookware cool down. Then remove the burnt pot and rinse with clean water. You will see that cleanse not only burnt, but also all the impurities that were in the pot, at the time it was hard to reach (area of the handles, reliefs, etc.). Pour it on the burnt place of the vinegar, cover and leave for 2 hours. Then just wash the pan with detergent. Vinegar can replace citric acid from a bag or fresh lemon juice. Sour milk in your kitchen will be very welcome. Separate the serum and pour over the burnt pan. Leave overnight. In the morning drain the whey and wash the pan. If the penetration is small, just RUB the place hard with a sponge coated with a soft abrasive powder. Do not use a metallic loofah in order to avoid scratches, which subsequently threaten to turn into cracks. Do not use removal of burnt-cleaning of sinks and toilet bowls containing hydrochloric acid, because there is a risk that after treatment you poorly washed the pot and the acid gets into the food. You "ran" sweet jam or compote? Then, without delay, clean slab, pan and other surfaces soiled with sticky liquid. The sugar quickly solidifies, turning into a hard crust, and scrub it without damaging the dishes will be difficult. - soft washcloth or sponge for dishes. If syrup, compote or jelly got on the stove, just until the liquid is hot and not stuck to the surface, wipe it with a damp sponge. Especially love the streaks of plate with a glass surface - the sugar destroys the high-tech coating. 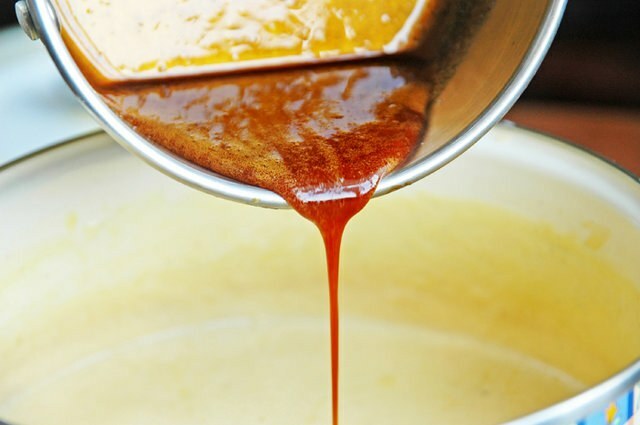 When baking sweet cakes and cookies often, the syrup flows to the pan and burn. Do not attempt to scrape this crust immediately. Cool the affected trays and soak them in warm water. If this is not possible, simply fill the trays with water to the brim and leave for an hour. Then pour water with soluble sugar and try to wipe the burnt remains soft sponge with detergent. If it failed again fill the trays with water. After re-processing will depart even stubborn dirt. Casseroles, pots and pans, you can clean faster. Pour in water, add a couple tablespoons of vinegar and boil pots and pans on the stove. After this treatment, and depart traces of caramel and burnt oil. Pour the boiling water and thoroughly rinse the pans with a sponge and detergent. The remnants of sugar and fat will peel away if you lightly RUB them with a soft, non-abrasive sponge. Rinse the dishes, so there are no remaining traces of vinegar. Clearing the dishes from the sugar stuck, do not forget about its bottom. Finding on the bottoms of woks or pots sugar crust, soak the dishes in the sink with warm water for 10-15 minutes and then wipe off the remnants of a hard sponge. If you find sugar stains inside the microwave oven, put on a rotating tray with a glass of water and turn on the oven for 10 minutes. Then remove the beaker and wipe the surface with a damp sponge. The steam will soften stuck sugar, and it is easily washed from the walls of the microwave. If your sweet cake prepared in the oven, splashed it with syrup, you will need a more thorough treatment. Soaking will not help, you will have to use a special tool for cleaning ovens. Make sure that the chosen cream or gel cleans the carbon deposits without harm to ceramic and enamelled surfaces. Wear sturdy rubber gloves, provide respiratory protection (e.g., with a gauze bandage). Apply the product on the inner surface of the oven. Treat the bottom and the recesses for the trays. Leave the gel or emulsion for some time (the exact recommendations for use indicated on the label of the bottle). After the allotted time, wipe the oven with a damp sponge to remove the cleaning tools. Most Housewives for preserves using copper utensils as it is believed that jam it is less burnt. However, if this happens, the Shoe takes a lot of time and effort. In General, the copper utensils in the preparation of jams rarely burn, however, if such a thing has happened, to fight prigaro best to use such substances as salt, soda, citric acid, soap and silicate glue. Of course, to clean copper utensils is possible to put in motion the purchase and powder detergents are specifically designed for copper, but most of them contain abrasive particles that have a negative impact on the appearance of the dish. 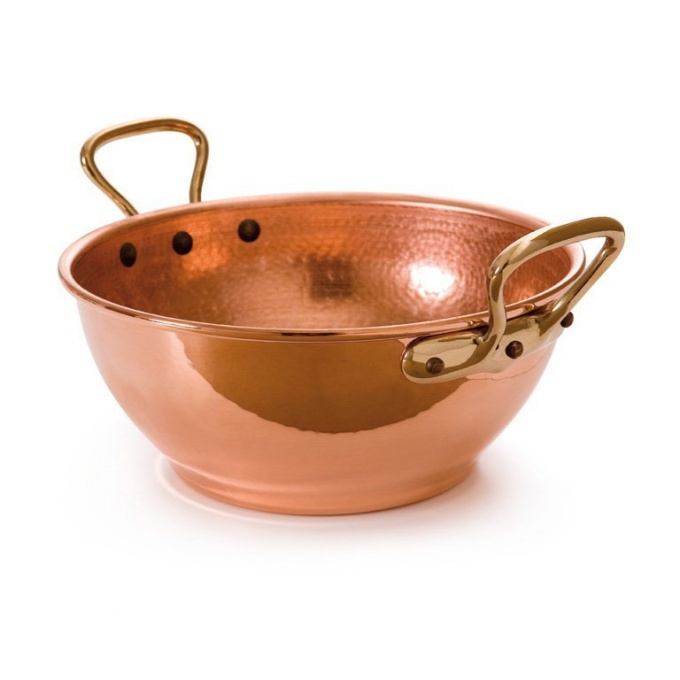 If you want your copper basin remained as new for a long time, use to clean it with one of the following instructions. First, remove the jam from the bowl with a spoon, taking care not to scratch the cookware itself. Then pour into a bowl of water above the sludge and add some citric acid (per liter of water you need one teaspoon). Cover the bowl with a lid and put it on a slow fire for 10-15 minutes. After some time, turn off the gas and let the water in the basin to cool completely, then wash it as usual. The combination of soda, soap and silicate glue copes with burnt jam in a copper pot, especially if you do everything right. So in the copper basin left traces of burnt, fill it with water and add a tablespoon of baking soda, soap (pre-grate it on a grater) and glue (amounts stated per liter of water), mix well and put on fire. Wait until the contents of the pelvis comes to a boil, then turn off the gas. Once the water has cooled, brush the bottom and sides of the basin with a stiff brush (not metal) and a good rinse.